July 22, 2015 – New York City – The "STOP IRAN RALLY," the largest, grassroots bipartisan American protest against the deal granting Iran a fast track to a nuclear bomb, will be held in Times Square on Wednesday, July 22, from 5:30 to 7:30 p.m. Thousands of Americans from all faith traditions, political interests and communities, including Christians, Muslims, Jews, registered Democrats and Republicans, LGBT, Iranian-Americans, and others will demand that Congress vote down the Iran deal. 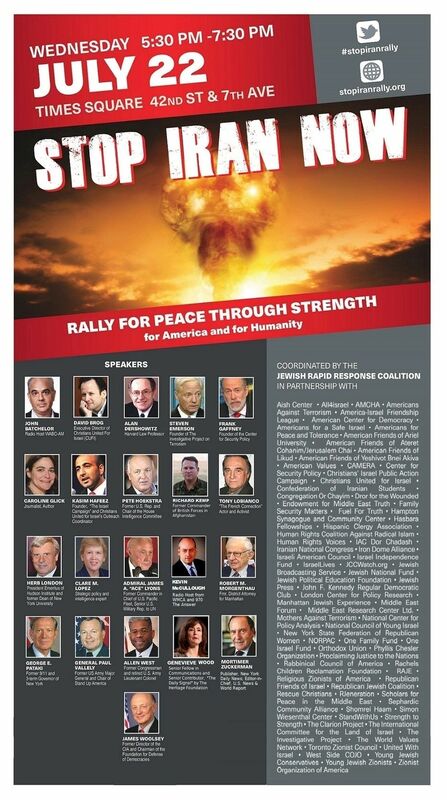 Under the umbrella of the STOP IRAN RALLY COALITION, more than 100 organizations spanning the nation's political, religious and social spectrum will participate. A roster of preeminent experts from senior levels of the military, government, academic, and media establishments will speak at the rally. "Strip away the administration's rhetoric and it's clear this deal gives the Mullahs – the world's foremost sponsors of terrorism, $150 billion in return for effectively nothing: no dismantlement of Iran's nuclear program; no anytime or anywhere inspections; no eradication of Iran's ballistic missile program; no maintenance of the arms embargo; and no halt to Iran's sponsorship of terror," said Jeffrey Wiesenfeld, STOP IRAN RALLY's co-organizer. Wiesenfeld added, "Washington is prepared to give Iran virtually all that it needs to get to the bomb. To release $150 billion to Iran will result in the expansion of worldwide terror. New York Senator Charles Schumer has the votes as presumptive leader to override this deal if he wants. To do anything less is cynical and disgraceful, and the public will not be fooled this time. Americans will not stand for another North Korea. If this deal is not stopped, New York voters will know whom to blame." "The Administration uses scare tactics in falsely claiming that the alternative to this deal is war," said Steve Emerson, Executive Director of The Investigative Project on Terrorism and a speaker at the STOP IRAN RALLY. "This deal would actually lead to more war, many more deaths of Americans and our allies and much more international terrorism." "This is a bipartisan issue, not a political one," said Richard Allen, a local activist leading the STOP IRAN RALLY volunteers. "Now, Congress must rise to the occasion and expose evisceration of U.S. national security and pass a resolution of disapproval. Congress must also override President Obama's threatened veto, and return America's Iran policy to dealing from a position of strength rather than appeasement. We are mobilizing nationwide to let our lawmakers know we will hold each and every one of them to account for the consequences of this dangerous deal being foisted on the American people." "The President publicly asserts that the U. S. 'will maintain our own sanctions related to Iran's support for terrorism, its ballistic missile program, and its human rights violations.' In reality, this deal removes the most severe terrorist sanctions in place against Iran for years; it removes the embargo on weapons sales to Iran against the explicit warnings of our own Secretary of Defense and head of the Joint Chiefs of Staff; it allows for Iran to continue developing its intercontinental ballistic missile program that can only have one mission – attaching nuclear warheads; it provides Iran with billions of unfrozen assets that Iran will surely pour into worldwide terrorism as it has done for 30 years; and it shamefully decouples any linkage to Iran's continuing imprisonment of an American Marine and four other American civilians not to mention its brutal suppression and execution of its own dissidents. Not buying into the WMD rhetoric. Our own President Bush tried to sell us on WMD. Those that refuse to read President Obama's response to this "international" agreement (not just American) are selectively choosing to blind themselves with ignorance. It's not our grandfather's Iran. Japan bombed Pearl Harbor and today they're one of our closest allies. Dialog is always a good thing. War and ignorance, are not. We Wont Get Fooled Again..or will we? We presently have an anti American traitor in the white house who is hiding in PLAIN SIGHT. The Who did one of my favorite rock songs of all time...WE WON'T GET FOOLED AGAIN...or will we? America, wake up....we need a Pro American leader. My father, one of THE GREAT GENERATION fought in WW2 against Nazi terrorism, if they caved in we would all be speaking German now. It's high time we all think, speak and act with common rational sense. In my heart, I believe most Americans want a unified country with traditional family values known for its excellence like it once was. And the funny thing is...I am one of those reformed baby boomers who was once fooled into thinking otherwise and helped tear America down in the sixties...And if you werent raised in the sixties you were slowly being indoctrinated by radical socialist and fascist ideas and thought it was COOL! GUESS WHAT? ITS NOT COOL, ITS SELFISH NONSENSE! AND WE ARE FAILING MISERABLY JUST AS OTHER ONCE POWERFUL SOCIETIES AND CULTURES HAVE...LETS THINK , SPEAK AND ACT RESPONSIBLY WITH COMMON RATIONAL SENSE!. Is there anyone out there interested in meeting up in Pittsburgh and protest this deal and also support to bring home the four Americans being held hostage? Et tu, Brute. Is it ever appropriate to talk about our very own enemies within? Is it ever possible to admit the obvious, that Obama is cooperating with the enemy? Obama has shown an intent to take this deal to the UN today, Monday, for their acceptance or rejection. He isn't waiting for Congress to approve it and certainly not waiting for them to disapprove it. So what can the rally accomplish?